St Nicholas Market is a Shoppers heaven, the best brands and the most beautiful trinkets is what the place is all about. The place displays an amazing range of independent retailers is a perfect place to shop your heart out. The place also displays original work of art and photography which make the best gifts and souvenirs. From vintage clothing to the most gorgeous jewellery this place is sure to charm the shopper in you. Wine Street (Stop se) station is the closest bus station in the place. Avis Bristol Temple Meads Train Station is the closest train station and hence can get you to your destination. How popular is St Nicholas Market? People normally club together Temple Church and Cabot Circus while planning their visit to St Nicholas Market. Great range of food stalls here. The juice counter is a definite must, My personal favourite is the kale smoothie, sounds weird but is lovely. I would also try the falafels, but there are many others the look good but I haven't yet tried. Lots of cuisines offered at reasonable prices (5-8 pounds)! A friend tried the noodles and said it was her best meal in the UK. The rest of us had Moroccan food, which was yummy. The line for the falafel pita store was really long. There's a pie store that sells a huge list of different pies, including vegan options. Besides food, there are also old book stores, antique stores, card game shops, all contributing to a uniquely quaint vibe. Def worth a visit and a lunch stop! 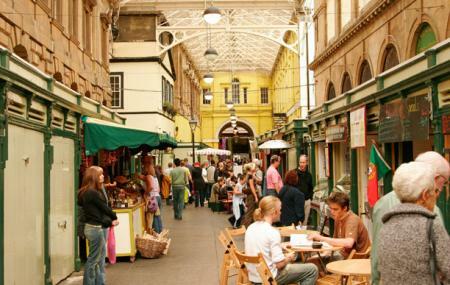 It's a pity, Bristol really needs a good, varied fresh food market, and St Nicholas Market would be a great place for such. It has many varied hot food vendors, some are better than others, but I pretty much never go to the indoor market which is a bit tatty, full of stuff most people would never buy, like expensive polished rocks or identical wallets in a dozen different shades. Eat A Pitta is great, as is the Caribbean vendor and the juice bar opposite it. However, I can't remember the last time I went there, as there isn't really a lot to attract. Stayed in Brooks guesthouse right in the heart of St Nicholas market great spot. Take some time to explore the market it's fab and it's surrounding streets. Plenty to eat with an amazing choice to suit everybody's needs. A must when visiting Bristol.